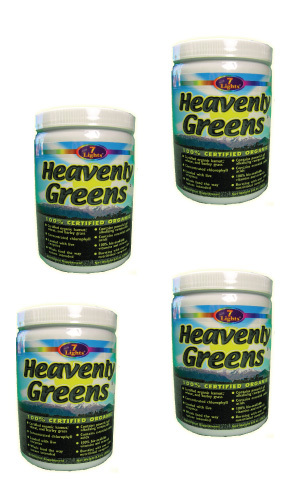 Heavenly Greens is a highly nutritious green food supplement. Heavenly Greens is a super concentrated blend of 100% Organic Wheat and Barley Grass. This complete live food supplement is filled with bio-available vitamins, minerals, rare trace minerals, live enzymes, amino acids, phytonutrients, antioxidants, and fiber. Grown in fertile, unpolluted, and mineral rich soil, the grasses used in Heavenly Greens are nutrient-rich and minimally processed to give you one of the highest quality super green foods available. Heavenly Greens is abounding with blood building chlorophyll that provides our bodies with the power to regenerate at a molecular and cellular level. A regular consumption of Heavenly Greens will provide your body with highly alkalizing compounds, while nourishing and oxygenating your cells. No other greens product can compare to Heavenly Greens in price, quality, or effectiveness. For almost 10 years, Heavenly Greens has been a proven winner, and users know why. Begin using Heavenly Greens today, and you will be on the path to optimal health. Heavenly Greens is a Great Source of Minerals. Heavenly Greens contains a super concentrated blend of 100% certified organic Wheat grass, and Barley grass, two powerhouse green foods that have been used for thousands of years for health building purposes. This biologically active whole food matrix is bursting with over 100+ naturally occurring nutritional complexes including vitamins, minerals, rare trace minerals, live enzymes, amino acids, phytonutrients, antioxidants, fiber, and a perfect ratio of proteins, fats, and carbohydrates. 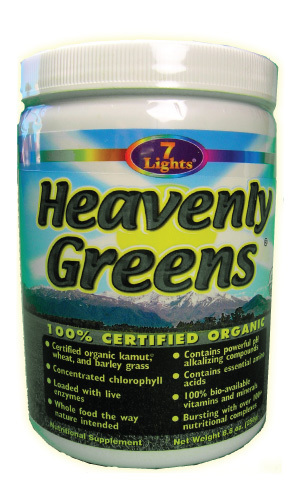 Heavenly Greens is also one of the highest chlorophyll rich super foods in the world. Chlorophyll's health building power comes from its molecular structure, which is composed of all seven colors of the rainbow. Heavenly Greens will supply highly alkalizing compounds to your body, nourish you cells with oxygen and nutrition, and naturally energize you for hours. Live Green Foods Help with Skin Diseases, Diabetes, Arthritis, Obesity and Other conditions. Suggested Use: Take 1 tablespoon of Heavenly Greens with 8 oz. water/juice once or twice daily.. Directions: MIx one level tablespoon of Heavenly Greens 1-2 times daily with 8 ounces of water, juice, or beverage of choice. Best consumed first thing in the morning or between meals. Daily dosage can be lowered or increased depending on individual and intended purpose. First time users may experience slight detoxification effects. Based on serving size of one tablespoon. None of the information published on this website is intended to diagnose, treat, cure, or prevent any disease, nor do we prescribe any of the supplements, materials, techniques, or concepts presented as a form of treatment for any illness or medical condition. This website is not intended as a substitute for professional medical advice of any kind from a licensed health care professional. Nutrisimo.com is not responsible for the content of articles written by contributing authors. The purpose of this website is to share educational information, scientific research, health news, and biblical insights along with offering for sale various products that line up with those philosophies. Nutrisimo.com supports naturopathic, holistic and biblically based approaches to health. Nutrisimo.com recognizes that within the fields of health, medical, dietary, and exercise there are widely divergent viewpoints and opinions. Before beginning any health related program it is recommended that you obtain the consent and advice of a licensed health care professional first. Should you choose to make use of any of the information contained on this website or purchase any of the supplements offered without first consulting a health care professional, you are prescribing for yourself, which is your Constitutional and Divine right. However, neither Nutrisimo.com, nor any of the contributing writers assumes any responsibility for the choices you make. All trademarks, registered trademarks and service marks mentioned on this site are the property of their respective owners.